Chocolate and Banana. 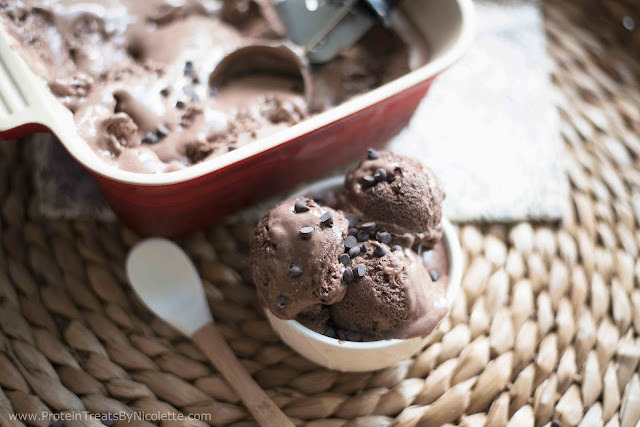 A flavor combination loved by many - now add some milk, ice, and protein to it and you've got a cold, delicious bowl of healthy ice cream. The banana not only adds flavor but also creates a smooth and creamy texture. 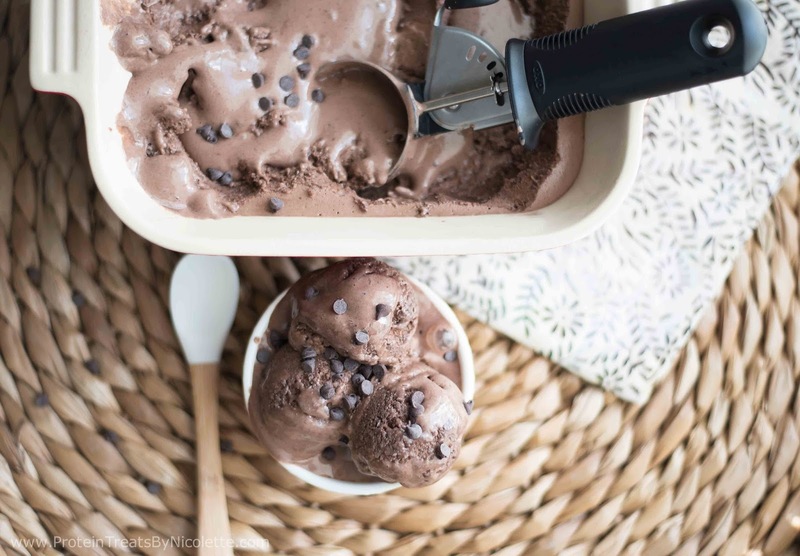 A full serving of this cold treat packs on 14.6g protein! Talk about a perfect post-workout treat! 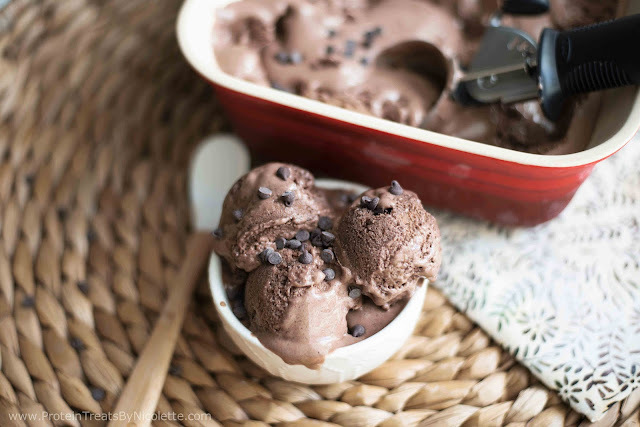 This easy and rich protein ice cream is loaded with one of my favorite chocolate protein powders - Lean Body for Her chocolate whey. I used 5 scoops in the recipe, which is a ton!! But you honestly would NEVER know it's a healthy version of a all-time favorite summer treat. Enjoy! 1. Place all of the ingredients in a 9-cup food processor or very large blender. 2. Turn the processor on and blend for about 5 minutes total, or until mixture is completely smooth. 3. Stop to scrap the sides of the bowl a few times to ensure all ingredients get blended well. 4. 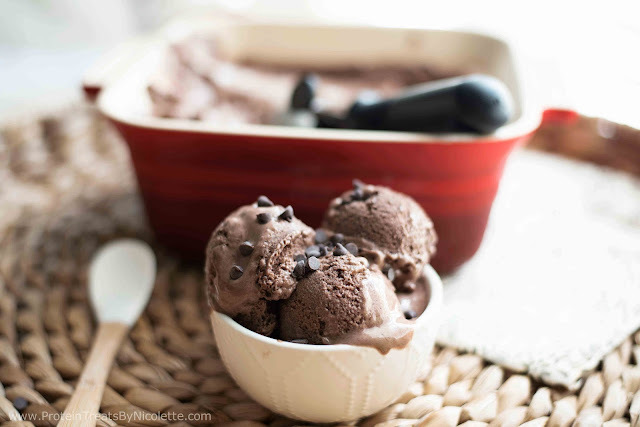 Spoon ice cream into a 2-quart container and place in the freezer for at least 2 hours. 5. 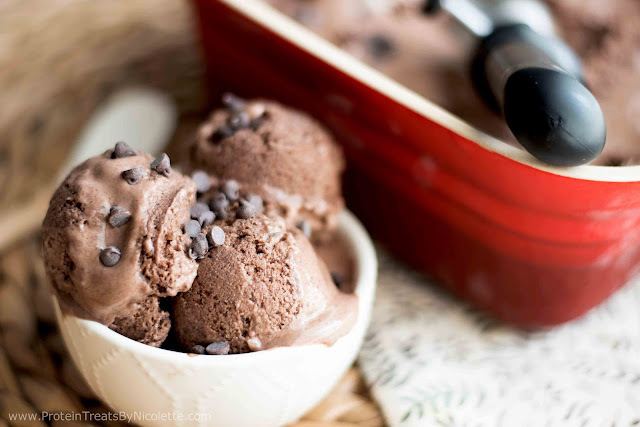 If ice cream is completely frozen, allow it to sit at room temperature for about 10-15 minutes before serving. Top with chocolate chips if desired. What brand of Chocolate milk did or do you use? Could you use maybe 2-3 scoops instead of 5 scoops of protein (and what'd you replace it with)? You probably can. It really depends on the protein powder you use, also. I would add an extra banana to replace the thickness you will miss from decreasing the amount of protein powder.